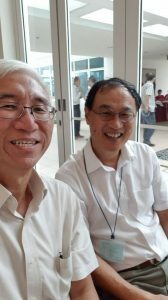 The preaching symposium was held on 8,9 March 2018 in celebration of Trinity Theological College’s 70th anniversary. It was one of many other events to be held. I saw the publicity information, the titles and speakers at the symposium, and it perked my interest. Topics included: What is Preaching? The Bible and Preaching, Theology of Preaching, Preaching and Liturgy, Preaching as Pastoral Care, Preaching in a Pluralistic Society, and Preaching and Church Growth. The workshops included: Preaching on NT Genre, Preaching on OT Genre, Preaching a word from the Lord, Preaching by Listening to the World, Preaching as Evangelism, and Interest Groups: 1) Preaching to Children 2) Preaching to Youth. As it turned out more than 400 signed up including the Mandarin version. 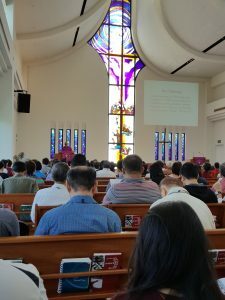 The English-speaking version was held in the chapel while the Mandarin-speaking version in the multi-purpose hall. I hope the organisers see the work of the Holy Spirit in drawing his servants to this conference. There is a real hunger among pastors to be more effective and faithful in their preaching ministry. I have always been interested in the craft of preaching and for many decades have read one book a year on average, and even more in some years. So I would consider this symposium as an equivalent to my annual reading. The topics were relevant and interesting. They were comprehensive but I came away wishing they had added something about “Preaching and Prayer” and look at the role of silence, solitude and prayer in the formation of the preacher, in sermon preparation, and in gaining insights on Spirit-guided applications. Perhaps another one on, “Preaching to Today’s Audience”. The panel discussion that answered the questions from the floor were helpful and enlightening. One person asked about the way the preachers in the panel have seen themselves changed in the way they preached today compared to when they first started out. Another great question was about what sea change in the audience that the preachers have observed over their decades of preaching? One answer stood out: today’s church member is consumer-oriented unlike the members from the older generation, who were loyal to their traditions and churches. The sessions were back to back from morning to late evening, with “no rest for the wicked”. I had to skip a few sessions as I felt over-saturated with information. I also found the session after lunch particularly difficult to pay attention to. On the whole I was glad with what I gleaned. I would have preferred a wider and comprehensive treatment of the topics. A few of the lecturers picked a key passage as a basis for the support of their talk. This narrowed the number and breadth of the truths they can draw from the limited text. If they had a topical approach, more insights and balance could have been shared about the subject as “all scripture” can be utilised to shed light upon the subject instead of one key passage. For instance the talk on “Preaching as Pastoral Care” used the text in Isaiah 40 where comfort was emphasised and what was communicated was a truncated form of pastoral care: comfort, consolation, support and tenderness. However, real pastoral care included reproof and rebuke, and even church discipline. What is the role of preaching in communicating and implementing discipline? That would have been a helpful facet to learn about! This was missed out because an expository approach was employed and it was based largely on one passage. Good thing this could be clarified and explained during the panel question and answer. It was the same for the lecture on “Preaching in a Pluralistic Society’ which was based mainly on an exposition of Acts 17:16-24. Perhaps the organisers wanted such an approach as a form of demonstration of how good exposition should support whatever case you make about those subjects, so I do not wish to dwell too much on this issue. 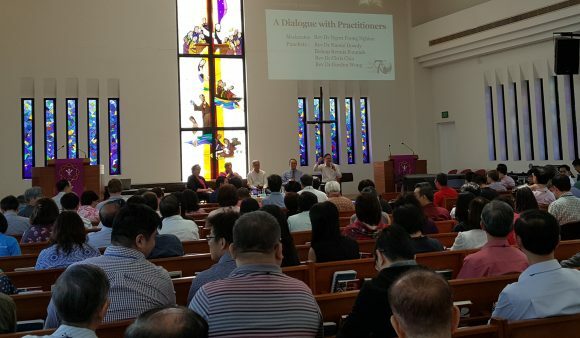 I was impressed that they invited Rev Dr Naomi Dowdy, a well known Pentecostal preacher, former senior pastor of megachurch Trinity Christian Centre, and Chancellor of a theological college, to sit in the panel and share her wisdom. Another woman who made an impression on me was Rev Dr Maggie Low. Her lecture on “The Bible and Preaching” was basic understanding for preachers but her delivery led me to conclude she is one of the best women preachers in the city! She was articulate, passionate and connected well with the audience. On the whole, I enjoyed it and wished they would organise more of these, more frequently. I applaud the organising committee and say a big thank you to Trinity Theological College for organising this.